The Dulles International Airport Air Traffic Control tower. President Trump announced Monday a plan to privatize the nation's air traffic control system — a move that would remove the job of tracking and guiding airplanes from the purview of the Federal Aviation Administration. "Today we're proposing to take American air travel into the future, finally," Trump said. The nation's air traffic control system was designed when far fewer people flew, Trump said, calling it "stuck, painfully, in the past." He also called the system "ancient, broken, antiquated" and "horrible" and said his reforms would make it safer and more reliable. The FAA has worked to upgrade its system, but Trump and other critics say it was taking far too long. "Honestly, they didn't know what the hell they were doing," Trump said. "A total waste of money." Privatization of air traffic control is an idea long supported by most of the commercial airlines. Executives from those companies joined the president at the White House to announce the plan. Guided by legislation that has been proposed in the past by House Transportation Committee chairman Bill Shuster, a private, nonprofit corporation would be created to operate, manage and control air traffic control nationwide, similar to what Canada does. The FAA would still have some oversight capacity, but a board made up mostly of representatives of the major airlines would govern this corporation. The air traffic controllers' union is generally supportive of the proposal, as it sees the current FAA air traffic control system as somewhat inefficient. The Shuster plan would still allow for the controllers to be part of the union. The FAA says it has modernized in recent years by updating its computers and other systems. Administrator Michael Huerta told an industry conference in March that the agency has made "tremendous progress," per The Associated Press. But some groups have been critical of efforts to privatize air traffic control operations, saying it gives the airlines too much control over the system for their own benefit. The group Flyers' Rights calls it the "creation of an airline controlled corporate monopoly." It also says privatizing air traffic control amounts to "handing the airlines (for free) control over a core public asset, and providing them nearly unbridled power to extract new fees and increased taxes from passengers." Trump has been critical in the past of the FAA and air traffic control, saying his personal pilot has complained about how out of date and inefficient the agency is. Trump's plan to privatize air traffic control operations will likely be included in legislation reauthorizing the FAA. The Senate Transportation Committee will discuss the proposal on Wednesday, with Trump's Transportation Secretary Elaine Chao testifying. Chao will again address the issue before the House Transportation Committee on Thursday. This plan is part of Trump's broader infrastructure vision. He may also talk more broadly Monday about what he has called "third world airports" in particular, as he launches what the White House is calling the president's "infrastructure week." Trump will be in Cincinnati on Wednesday to continue talking about infrastructure, focusing on inland waterways on the Ohio River including aging dams. The White House announced a plan today to privatize the U.S. air traffic control system. This is part of the administration's focus this week on the country's aging infrastructure. President Trump says the FAA has been trying to update the air traffic control system for years. PRESIDENT DONALD TRUMP: But after billions and billions of tax dollars spent and the many years of delays, we're still stuck with an ancient, broken, antiquated, horrible system that doesn't work. MCEVERS: The president's plan to modernize air traffic control by privatizing it has a number of supporters and some critics, too. Here's NPR's David Schaper. DAVID SCHAPER, BYLINE: President Trump says the nation's air traffic control system is stuck painfully in the past. TRUMP: At a time when every passenger has GPS technology in their pockets our air traffic control system still runs on radar and ground-based radio systems that they don't even make anymore, they can't even fix anymore. SCHAPER: Flanked by airline executives, the president said flight delays and air traffic control inefficiencies cost the nation's economy billions each year. TRUMP: We're proposing reduced wait times, increased route efficiency and far fewer delays. Our plan will get you where you need to go more quickly, more reliably, more affordably. SCHAPER: The president's plan calls for a three-year transition in which air traffic control operations would be turned over to a private nonprofit entity, similar to how it's done in Canada. The FAA would continue to provide safety oversight while the private entity would be run by a 13-member board made up of airport and airline executives, labor unions and other stakeholders. PAUL HUDSON: The airlines would essentially be in charge of the skies. SCHAPER: Paul Hudson is president of the passenger advocacy group flyersrights.org. He argues this could be risky. HUDSON: Hardly a week goes by that they haven't had a - either a shutdown through computer outages or videos that show mistreatment of passengers. And it goes on and on. SCHAPER: The Trump plan would eliminate ticket taxes on passengers, replacing it with a more direct funding scheme. And that concerns Democratic Congressman Peter DeFazio of Oregon, ranking member of the House Transportation Committee. PETER DEFAZIO: What fees are you going to pay to this private corporation to get on the plane? The airlines hate the ticket tax and want to do away with it, but what's the new system? What's that going to do to general aviation? What's that going to do to businesses aviation, cargo? We don't know. SCHAPER: DeFazio also worries that privatizing air traffic control operations could actually slow recent progress the FAA is making in implementing its new satellite-based system called NextGen. But Robert Puentes, who heads the nonpartisan think tank Eno Center for Transportation, disagrees. ROBERT PUENTES: There's no doubt that moving to this independent nonprofit system would be able to deploy this new technology faster than the way that we're doing it right now. SCHAPER: Puentes says years of uncertain budgets and partisan gridlock have slowed the implementation of NextGen, and he argues privatizing air traffic control would provide stability. PUENTES: This really isn't about deconstructing government. This isn't getting government out of transportation. It's not selling off assets, anything like that. This is really about getting this very important investment done much faster. 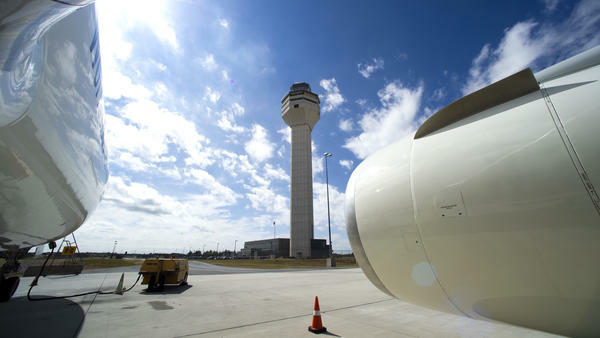 SCHAPER: Nonetheless, some Republicans have joined Democrats in opposing efforts to privatize the air traffic control system in the past, so like many other elements of the president's agenda, this plan likely has some turbulence ahead. David Schaper, NPR News. Transcript provided by NPR, Copyright NPR.